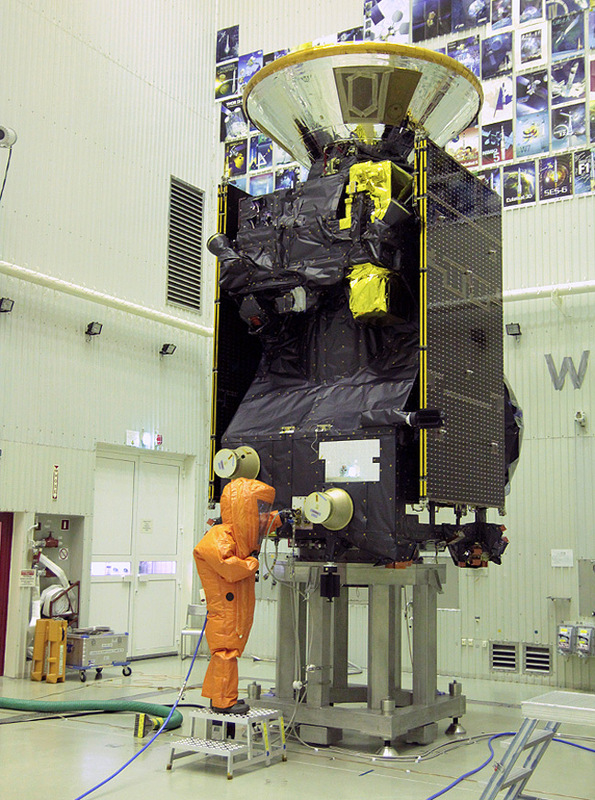 The European Space Agency (ESA) has released a nice snap of a rather lonely figure in a chemical suit fuelling the ExoMars mission's Trace Gas Orbiter (TGO), due to launch between 14–25 March 2016 from Baikonur Cosmodrome. ESA describes the fuelling operation as "a hazardous exercise", perfectly reasonably since the TGO's main engine and 10 thrusters burn a hypergolic mix of monomethylhydrazine (MMH) and mixed oxides of nitrogen (MON). MON is a blend of dinitrogen tetroxide (N2O4 - also known as nitrogen tetroxide, or "NTO") and a small amount of nitric oxide (commonly 3 per cent, to create "MON3"). The nitric oxide reduces the corrosiveness of NTO, while lowering its freezing point (−9°C for pure NTO, −15°C for MON3). MMH can cause "gastroenteritis, hemolysis, methemoglobinemia, hepatorenal failure, seizures, and coma", according to this guide to how certain false morel mushrooms - including Gyromitra ambigua and Gyromitra infulacan - can put a serious downer on your day. The guide elaborates: "Some Gyromitra mushrooms contain hydrazones, including the toxin gyromitrin (N -methyl-N-formylhydrazone). Gyromitrin rapidly decomposes in the stomach to form acetaldehyde and N -methyl-N-formylhydrazine, which is converted to monomethylhydrazine (MMH) by slow hydrolysis." Nasty. The TGO fuelling is being handled by a specialist team from Thales Alenia Space France, which also recently pumped hydrazine into the Schiaparelli "entry, descent and landing demonstrator module" (EDM), seen in the above photo mounted atop the TGO and below during cautious transportation at Baikonur. Both spacecraft will be lifted by a Proton-M rocket ahead of their seven-month trip to Mars. Once there, the TGO instruments will help "gain a better understanding of methane and other atmospheric gases that are present in small concentrations (less than 1 per cent of the atmosphere) but nevertheless could be evidence for possible biological or geological activity". Schiaparelli will descend to the Martian surface, slowed sequentially by parachute, hydrazine thrusters, and a "crushable structure" designed to absorb the force of the final impact.